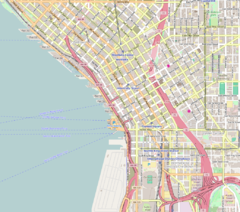 1000 Second Avenue is a 493 ft (150 m) skyscraper in Seattle, Washington. It was completed in 1987 and has 43 floors. Originally named the Key Tower and the Seattle Trust Tower for its largest tenants, it is the 15th tallest building in Seattle as of 2012[update]. In 1981, a $37 million, 41-story office tower was announced for the site of 2nd Avenue between Madison and Spring streets, sporting an "unusual" curved corner for the entire northwest edge, as well as plazas arranged in receding stacked terraces facing south. The development, planned by Canadian developer Cadillac Fairview and Federal Way-based CHG International, was designed by NBBJ principal Donald Winkelmann and would be built after securing a major tenant. In June 1984, real estate developer Martin Selig announced that he would pay $8.4 million to acquire the project in a property swap with Cadillac Fairview and CHG. The office building would serve as the headquarters of the Seattle Trust and Savings Bank. Demolition at the site began in November 1984, with a series of fire prevention tests conducted by the Seattle Fire Department inside the vacated United Pacific Building, an 11-story office building constructed in 1909 and donated for the test by Selig. The tests, each 15 to 30 minutes long, took place in prepared environments that simulated fires in high-rise buildings and evacuation protocols. One of the "most significant" of the tests was the monitoring of air pressure in elevator shafts and how this affects keeping smoke out of emergency access areas, as this data was needed for fire code updates. Upon the building's opening in early 1987, Seattle Trust announced that it was bought out by Key Bank, who renamed the building to Key Tower on July 20. Key Bank announced plans in May 1989 to move out of the building into cheaper space in the new AT&T Gateway Tower; Selig filed suit in court to block the move, alleging that the announcement would "diminish the market price of [the tower]" and that the long-term lease signed by Key Bank had agreed to a move in 1992. The suit was dismissed and Key Bank moved to the AT&T Gateway Tower in 1991. After the sale of the Columbia Center in 1989 to Seafirst Bank, Selig moved his real estate company's offices to the Key Tower. After the loss of Key Bank, the tower's name reverted to 1000 Second Avenue, which was the name of the Cadillac Fairview project from 1981. Since 2012, the building has been host to an annual rappelling event to raise funds for the Washington Special Olympics program. ^ "1000 Second Avenue". Martin Selig Real Estate. Retrieved February 19, 2017. ^ "1000 Second Avenue". CTBUH Skyscraper Center. ^ a b Lane, Polly (October 4, 1981). "41-story project will give city a new shape". The Seattle Times. p. F14. ^ Mahoney, Sally Gene (June 27, 1984). "Selig to build another tower". The Seattle Times. p. A9. ^ Mahoney, Sally Gene (July 1, 1984). "Caught his eye". The Seattle Times. p. D8. ^ Lane, Polly (October 13, 1984). "No alarm: Fire marshal plans tests in old office tower". The Seattle Times. p. A6. ^ Lane, Polly (November 29, 1984). "Firemen set for hot weekend of tests". The Seattle Times. p. B2. ^ Gough, William; Macdonald, Sally (December 2, 1984). "Building burns—for a good cause". The Seattle Times. p. D1. ^ Buck, Richard (March 26, 1987). "Purchase of Seattle Trust will bring a change of name". The Seattle Times. p. D1. ^ Buck, Richard (June 30, 1987). "State banks ready to open door to interstate banking". The Seattle Times. p. C1. ^ Lane, Polly (May 16, 1989). "Selig files lawsuit against Key Bank". The Seattle Times. p. C1. ^ Matassa Flores, Michele (August 18, 1991). "Towering vacancies: Competition for tenants is fierce as building owners try to fill downtown high-rises". The Seattle Times. p. E1. Retrieved February 19, 2017. ^ Matassa Flores, Michele (April 16, 1992). "New Selig foreclosure". The Seattle Times. p. B1. Retrieved February 19, 2017. ^ "Selig won't manage tower for new owner". The Seattle Times. January 20, 1990. p. B8. ^ Lane, Polly (January 26, 2000). "Selig on the rise again". The Seattle Times. p. A1. ^ Nelson, David (July 19, 2012). "Get over your fear of heights or embrace your love of heights for the Special Olympics". Seattle Post-Intelligencer. Retrieved February 19, 2017. ^ "Immigration protesters occupy building, block streets". Seattle Post-Intelligencer. May 19, 2010. Retrieved February 19, 2017. This page was last edited on 15 August 2018, at 06:31 (UTC).